So while “Moanin’ Lisa” was short on laughs and big on sentimentality it did a fine job fleshing out the characters and relationships of all the Simpsons, especially poor, sweet, ever-suffering Lisa, the Job of Springfield, doomed to be ignored and ridiculed by those she tries to show the light. That’s a big part of what makes Lisa such a great character: we laugh, but we feel her pain. Right? (And here I’m excluding those who feel Lisa’s a drag—more Lisa for the rest of us.) I love Lisa Simpson. Not just for how she embodies so feelingly the loneliness of the kind, decent, and intelligent in a world seemingly populated by 95 percent boorish, self-interested, hair-trigger goofballs. Or for how Yeardley Smith continues (29 years on) to imbue this perpetually unappreciated little girl with an aspirational hopefulness that, yet, retains enough authentic, overmatched childishness to make her outsider status all the more heartbreaking. No, Lisa Simpson is the heart of a show that seems to have misplaced its own decades ago. In “Moaning Lisa,” jazz is Lisa’s soul’s song, and there isn’t a more appropriate expression of it. 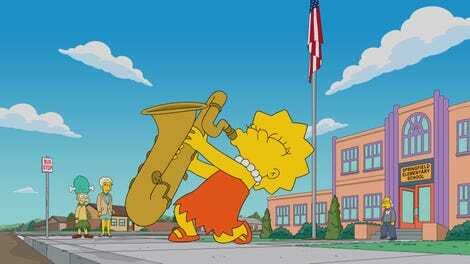 Explorational, ambitious, mournful even in joy, and, sure, sort of a hard sell, Lisa’s sax playing opens up nearly every Simpsons episode—right before she’s shooed out of burnt-out, pedantic music teacher Dewey Largo’s plodding, well-ordered band practice. So it makes sense that Lisa’s crisis of faith in her playing is kicked off by the dream-killing Largo, and mirrors a deeper fear that all of her smarts, talent, and humanity are similarly destined to come to naught. There’s a scene after Largo (high-fived by Skinner) offhandedly advises Lisa “There’s a world of Lisa Simpsons—bright, talented, doomed to disappointment,” where Lisa lies curled in a fetal position on her bed. Marge tries to comfort her disconsolate daughter with her signature well-intentioned platitudes (“You can’t let someone else’s opinion tear you down”) whose heartfelt sincerity only underscores how bereft Largo’s words have left Lisa. It’s momentarily affecting, especially with Smith giving voice to Lisa’s pain, but “Lisa Gets The Blues” quickly scatters any intention of recapturing the old Lisa Simpson tragicomic resonance over a succession of self-referential gags, inconsistently sketched character beats, and some of the most indulgent tourist rubbernecking the show has ever done. Waylaid to the much more preferable New Orleans after Marge’s plan to whisk the family off to see her music-loving aunt in Gainesville, “Lisa Gets The Blues” finds that—hold on to your hats—Homer really likes food, drink, and general overindulgence. 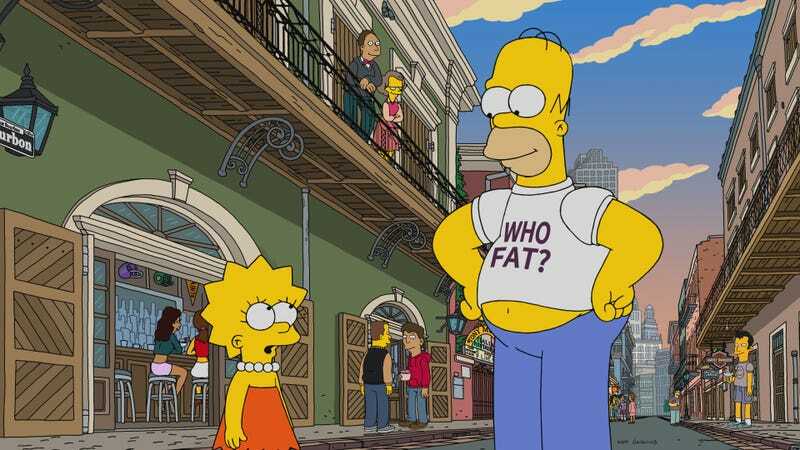 The episode—which, undeniably, looks great in its crisp, detailed travelogue of The Big Easy/Treme/other nicknames for New Orleans—takes an extended detour through the city’s culinary delights, as Homer lists off and devours dozens of signature New Orleans dishes. They all look delicious, sure, and the fact that the eating tour just keeps going becomes its own joke, but if the episode (credited to David Silverman and Brian Kelley) is going to echo Lisa’s initial jazz awakening, Homer’s foodie marathon (and subsequent vomiting marathon) comes across as what the show would rather be doing. And the whole Bleeding Gums thing isn’t a stretch—a young musician on the street who does a double take at the bummed-out Lisa looks an awful lot like the deceased jazzman. When Lisa—dragged to yet another bar by Homer—is pulled up on stage by the guy, the fact that he turns out to be Bleeding Gums’ nephew solves Lisa’s case of “the yips,” sending the episode out on the sight and sound of Lisa’ happily tootling as before. But along the way, Homer and Marge’s reactions to their daughter’s profound depression swing wildly wherever there’s a joke to be found. Marge, after counseling Lisa to follow her dreams no matter what, is shown rolling her eyes when New Orleans’ “jazz combo on every corner” charms don’t cause Lisa to snap out of it already. Pawned off on Homer, Lisa finds her dad similarly veering all over the place, parenting-wise. But while the impending milestone of television longevity set to make The Simpsons the longest-running scripted prime-time show in TV history is at least mathematically impressive, trading in some of the winking jokes about that would have been a good idea. The episode opens with the legend “30 years ago,” followed by some of the original Tracey Ullman Show clips, followed by a pair of title gags about how long the show’s been on, followed by a couch gag that calls attention to how hard it is to come up with new couch gags. (“We’re lumberjacks. Why is that funny?”) Then, after the main story comes to its unsatisfyingly dramatized conclusion, the tag returns to both Homer’s food obsession (to be fair, beignets are delicious), and another joke about how goddamned long The Simpsons has been on the air. Trust me, we know. When Bart’s seat-kicking proves the melee-inciting last straw on the family’s flight to Gainesville, David Patrick Kelly’s Luther from The Warriors shows up, bottles on his fingers and all. It’s sort of an Airplane! joke, but there’s a reason Airplane! still works. There’s a “Who Shot Mr. Burns?” Three Billboards gag in the opening credits, another callback that just makes me want to go back and watch the original episode again. Unsung Simpsons all-star Kevin Michael Richardson shows up in a number of roles, most memorably as the ghost of Louis Armstrong. He’s not as scabrously funny as Jordan Peele’s ghost of Duke Ellington, but Richardson’s always welcome. The Simpsons (Classic): "Lisa&apos;s Substitute"